2) Priyansh Sharma ranked 1 in Udaipur city in AIIMS 2015. Other 2 students also got selected in AIIMS 2015 from Resonance Udaipur study centre. 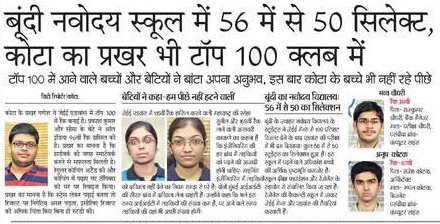 3) 50 out of 56 students got selected in JEE Advanced 2015 from JNV Bundi where Resonance is providing coaching at low coaching fee under its CSR Policies. 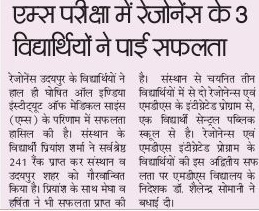 Also a hometown student, Prakhar Ganesh from Kota secured rank in Top 100. 4) 4 students from Resonance secured ranks in Top 100 JEE Advanced and 34 Students (updated) got selected in AIIMS 2015. 5) JEE Advanced 2015 Result comparison of major coaching institutes in Kota. Resonance tops the list with highest selection among all the institutes with 4050 (updated) selections.